A while ago I became interested by the two Egyptian obelisks that once stood in the now barren Circus Maximum in Rome; today they are standing in two of the city’s many piazzas. 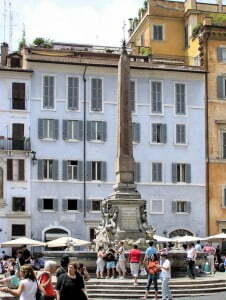 I wrote then about these and other obelisks in a recent post, Egyptian Obelisks in Rome. In continuing to research these wonderful ancient Egyptian objects and thinking about their move to the various cities around the world I came across a book entitled The Emperors’ Needles: Egyptian Obelisks and Rome by Susan Sorek. 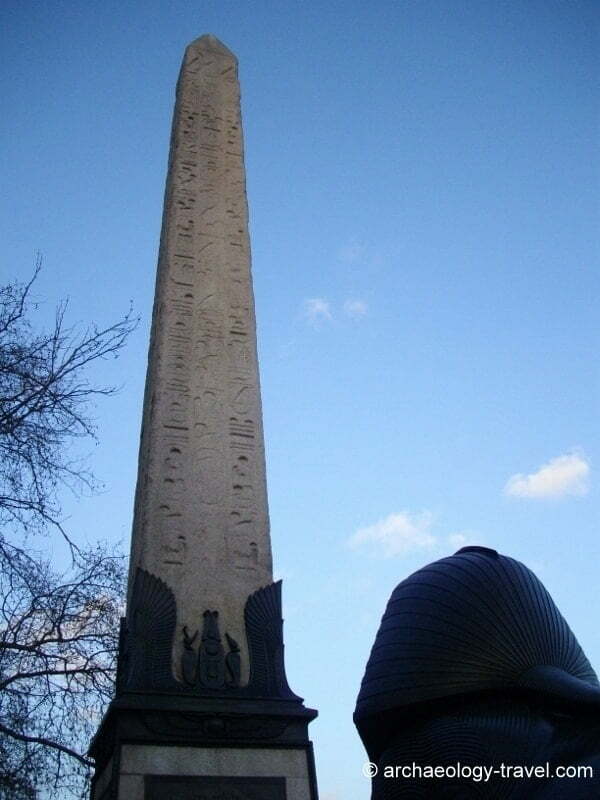 The socalled ‘Cleopatra’s Needle’ on the banks of the Thames, London. Of the numerous obelisks that once graced the many temples of ancient Egypt and proclaiming the greatness of the Pharaohs which they honour, there are only 28 obelisks still standing today – and of that number there are only six obelisks standing in Egypt. The rest are now located around the world, including New York, London, Paris, Istanbul and Rome. Although Sorek includes information about the religious significance and the making of Egyptian obelisks, her book is essentially the various histories of how and why each of these striking monuments stands where they do today. These histories are more like biographies. Each of the 28 obelisks has its own individual history. Collectively, the biographies span about four thousand years. Some of the standing obelisks in Egypt were created as long ago as four thousand years. Some then take an unexpected turn about two thousand years ago, when some time between 13 and 10 BC the Roman emperor Augustus became the first to remove obelisks from Egypt. And then as late as the twentieth century Egypt herself decided her modern capital city needed a monument from the pharaonic era and an obelisk was removed from Tanis on the Nile Delta to its present position on Gezira Island. Each obelisk is therefore implicated in quite radically different social and political agendas. And yet no matter where they are now, how they got there, each obelisk is linked to the others via a common past in ancient Egypt. The Rotunda obelisk placed on a decorative fountain with water-spouting dolphins. 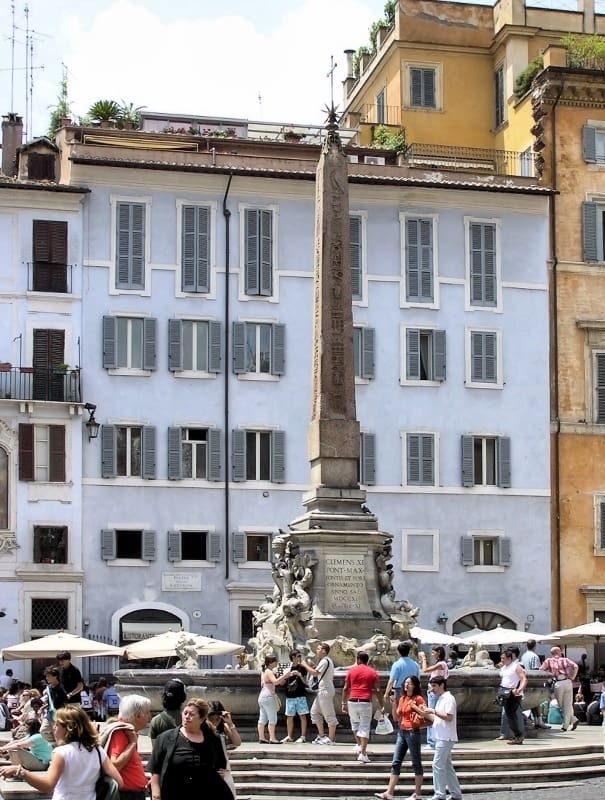 Understandably, sitting in one of the many piazzas of Rome – enjoying a break from sightseeing, it is easy to think that these obelisks are simply scattered about randomly, quaint additions in their contemporary surroundings often standing on highly decorative and elaborate bases. Sorek’s engaging social account of the changing historical circumstances these obelisks witnessed challenges such a simple view and gives these objects their due recognition. The book begins with brief account of pharaonic Egypt, followed by two chapters on the symbolic significance of obelisks in ancient Egyptian society and an account of how these objects were made. Thereafter 14 chapters cover two thousand years of Egypt’s contact with the West and the relocation of obelisks under the Roman Emperors and during more recent times. The Emperors’ Needles is not a dull academic tome, it is a very readable and accessible book that will be enjoyed by anyone who seeks something more than the basic comments one might find in a generic guidebook. For those intrigued by social and political history of ancient objects and artefacts and their movement around the world, the Egyptian obelisks make for a very interesting case study. 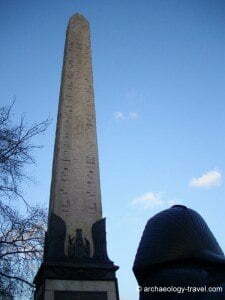 If you have wondered about the so-called Cleopatra’s Needle in London, or the Luxor Obelisk in Paris, neither of these are isolated artefacts of their kind in the West. On the contrary, they are in fact recent examples of Western rulers using Egyptian artefacts for their own personal and political agendas – agendas Susan Sorek outlines. And given that Rome has the most Egyptian obelisks standing today, 13 of the 28, this book is a must for the culturally interested traveller – whether you have been to Rome or planning your trip. Besides being very well written, all the chapters have been cleverly crafted to be just the right length. I really can imagine a sunny day or two exploring the Egyptian obelisks in Rome, sitting in a café on the edge of a piazza reading the biography of the dominant object on view. And then moving on to another piazza, another obelisk … and another café. 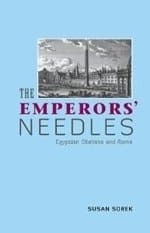 The Emperors’ Needles: Egyptian Obelisks and Rome, by Susan Sorek, was published by Bristol Phoenix Press (an imprint of The Exeter Press) in 2010 – there are 166 pages and 15 illustrations. A good bibliography and a detailed chronology are included, as is an excellent index. The book is available on both Amazon.com and Amazon.co.uk.